The definition of hate crime seems to be in danger of spreading so that it encompasses some minor or petty slights or insults. Truth and facts being ignored in favour of emotional or prejudiced viewpoints. The concept of ignoring the facts when reaching a decision about something, and letting the heart rather than the head rule, seems to be a phenomenon that’s on the rise. It has recently been labelled ‘post truth’. In the cartoon I’ve linked it to the phenomenon of conspiracy theories, which are frequently used as a way of justifying irrational or unproven ideas. 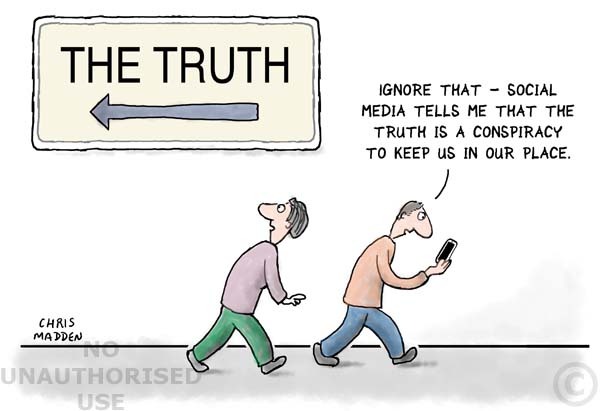 The rise of post truth tendencies is said to be linked to people’s increasing use of social media via phones and electronic media and the tendency for internet algorithms to send people only information that they already agree with – however the tendency has always been there in the way that people purchase newspapers that agree with their political and other views. It may also be linked to the current mistrust of experts. 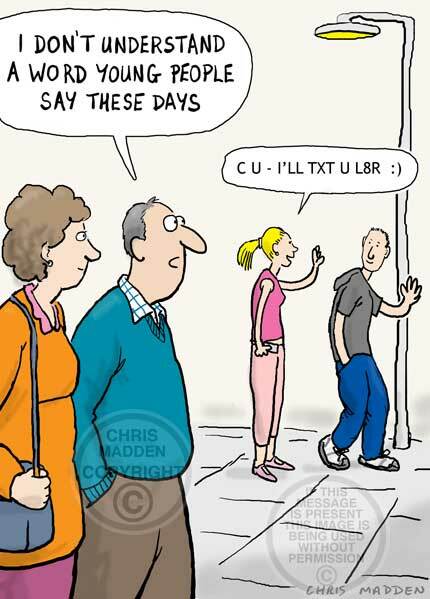 A cartoon about the tendency for people to record incidents raher than to intervene in them. 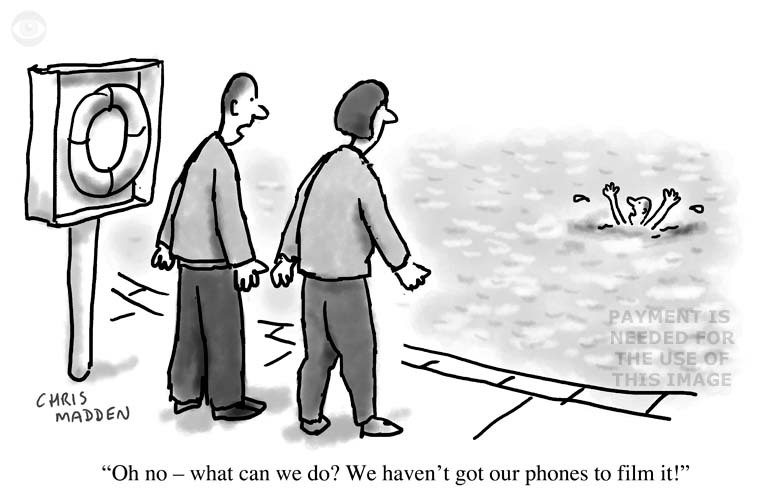 A cartoon showing people who are dismayed by the fact that there’s a man drowning in front of them, but that they haven’t got their phones with them with which to record the event. A cartoon about a dark side to “citizen journalism”. The adult colouring book craze – the infantilization of popular culture. 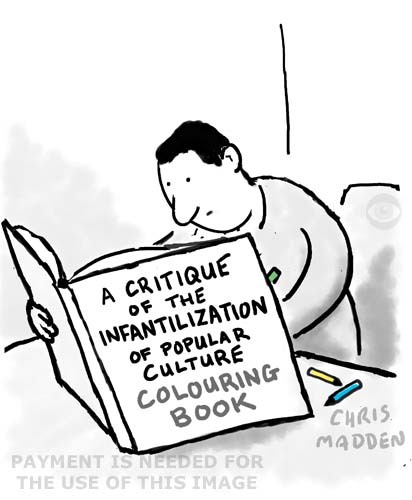 A cartoon showing someone reading an academic book about the fashion for adult colouring books. The academic publication is itself a colouring book. A cartoon about the publishing phenomenon of colouring books for adults. “No platforming” – the movement to deny a debating voice to speakers who’s views may be offensive to some of the audience. 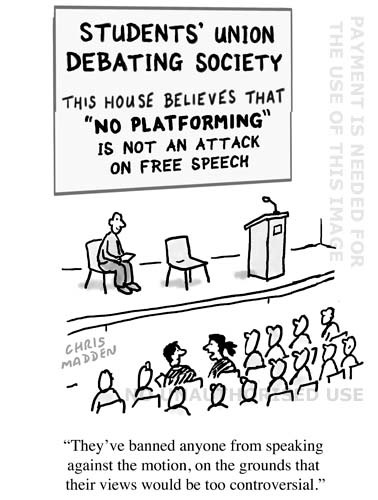 This cartoon is about the phenomenon of denying a platform in debates for speakers who’s views may be found offensive by some of the audience. The phenomenon is particularly prevalent in universities. “No platforming” can be seen as a form of censorship masquerading as a virtue. It is built on the premise that people have the right not to be offended. This may be a worthy aim, but it’s very much open to abuse, as the ‘right not to be offended’ can easily become a means of stifling debate. Apart from anything else, the airing of controversial views are crucial to the health of democracy. 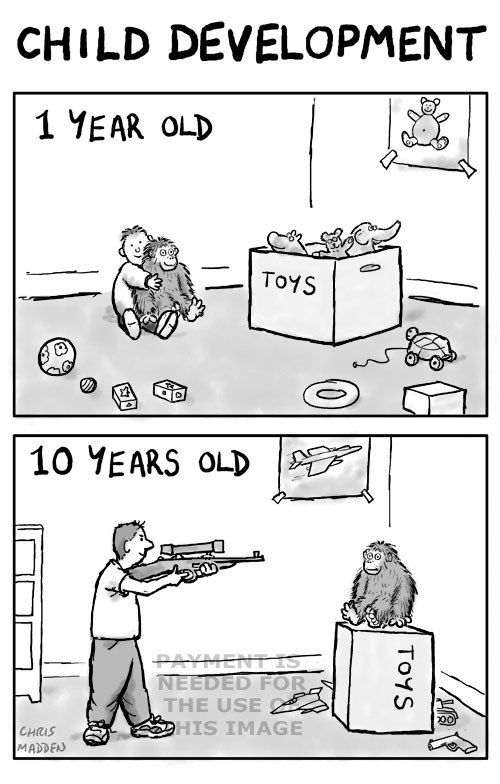 A cartoon about infantilisation in modern society. An animal hat worn by an adult. A cartoon showing an adult wearing a hat with an animal face on it. These hats are currently very popular for small children. There is a tendency for these animal hats to be adopted by young (and not so young) adults, usually female. 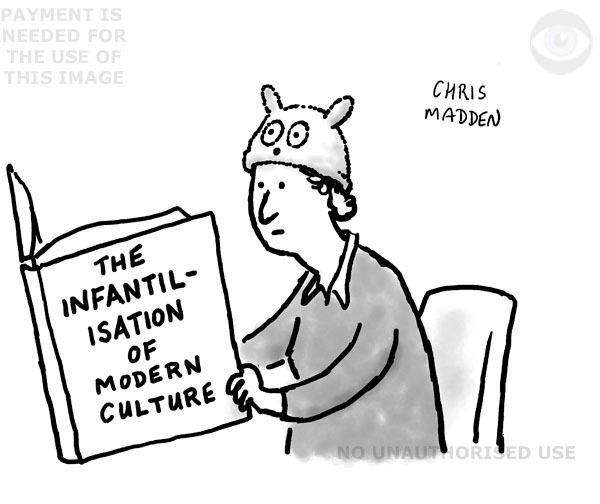 The person is reading a sociology book that is a critique of the trend towards the infantilisation of culture. 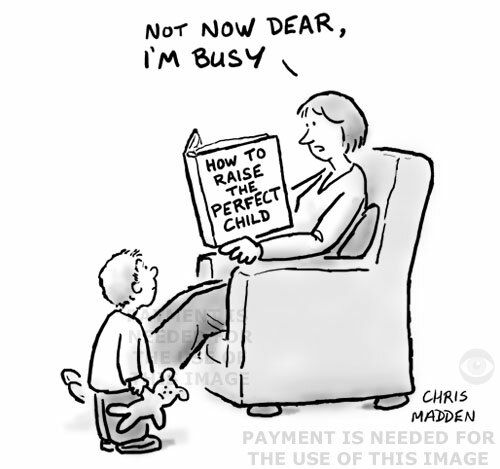 Cartoon about child psychology and child development. An image illustrating aggressive tendencies within people. Nature or nurture? A cartoon about driverless cars. Driverless cars are also known as driver-free cars, self driving cars, autonomous cars or robot cars. 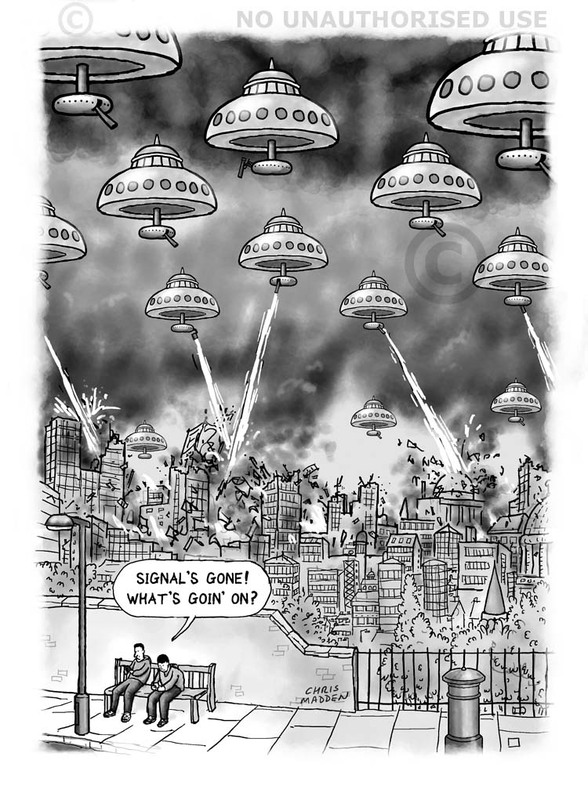 This is a futurology cartoon, predicting the future when self-driving cars are ubiquitous. 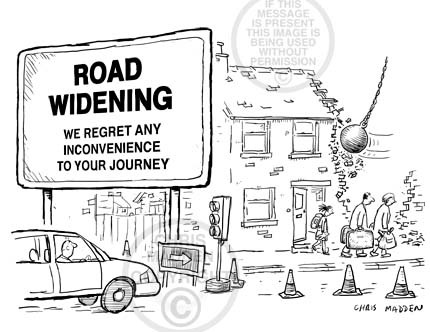 My view is that people will drive round whether they need to or not, simply because they can – a bit like the way people currently spend large amounts of their time glued to mobile phones even though they don’t necessarily have anything pressing to say. You can read an article of mine on the subject of driverless cars here. 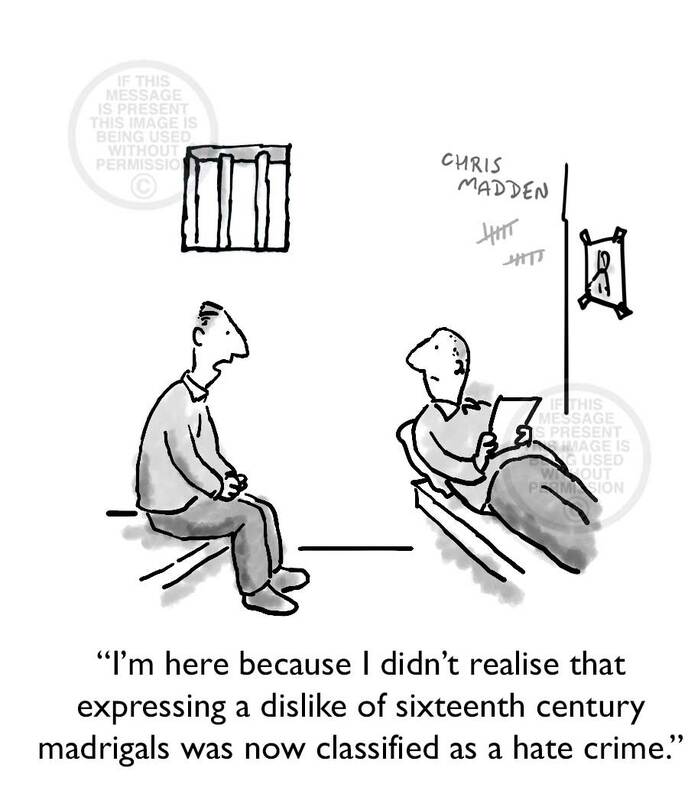 A cartoon about the tendency to invoke medical reasons for deviant personality traits, for abnormal personality traits or even for normal aspects of personality. An illustration about the medicalization of behaviour. This may include behavioural syndromes ranging from psychopathic tendencies and deviance to conditions such as hyperactivity, ADHD (attention deficit-hyperactivity disorder), rebelliousness or non-conformity. The drone in the image is being used by a stalker to stalk a woman. 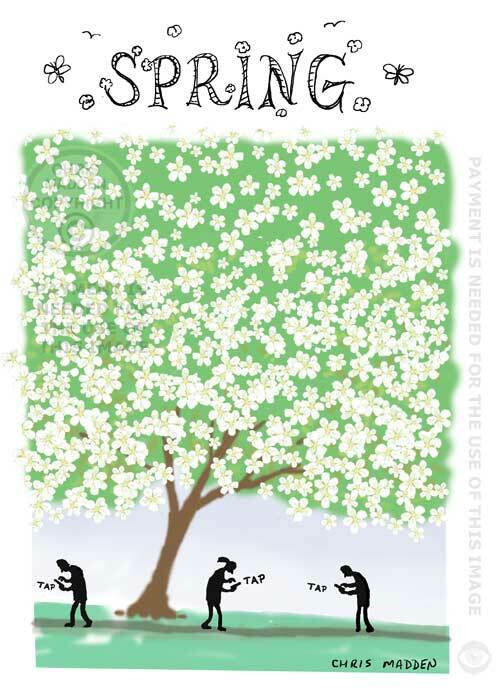 The cartoon shows a spring blossom tree in full bloom, with people staring at their phones instead of at the tree. Cartoon. Health and safety gone mad. 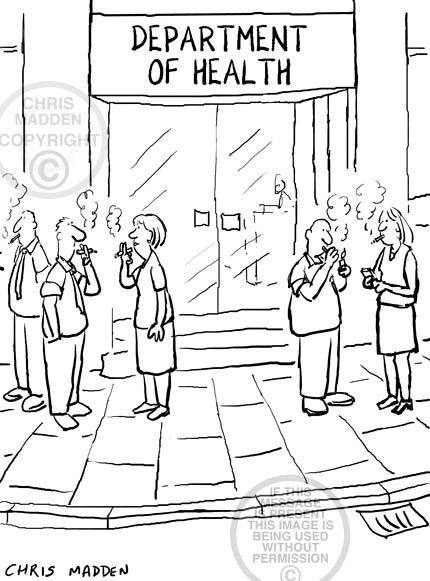 A cartoon about the petty rules and over-zealous implementation of laws concerning health and safety regulations. A humorous illustration showing an officious official making a judgement on a health and safety issue. A child wrapped in cottonwool to protect it from danger – but the cotton wool leaves the child’s face exposed to danger. In the wake of the Jimmy Savile affair there is a danger that unscrupulous lawyers will jump on the current wave of awareness of child abuse and will fish for victims, in a similar way that some law firms fish for victims of accidents in order to profit from the compensation claims that can be made. A cartoon about paedophiles, paedophilia, compensation culture, litigation culture andchild sexual abuse. A cartoon about the recent trend in television news coverage of exam results for students to be filmed hugging each other when they get their grades. The cartoon shows a man of dubious character applying to join a college of further education A-level course so that he can get hugs from attractive young female students when the exam results come out. 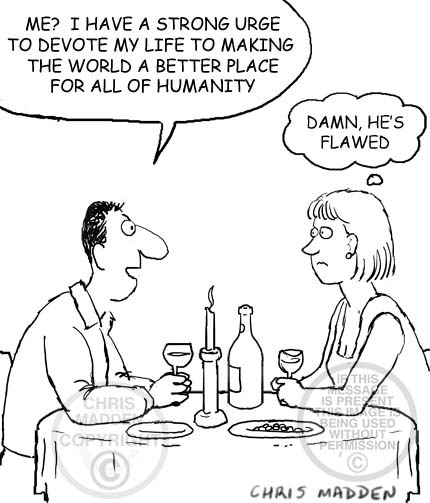 A cartoon about child rearing, parenting skills, hothousing, developmental psychology, education, educational pychology, yummy mummy, yummy mummies, misdirected ambition, bad parenting. 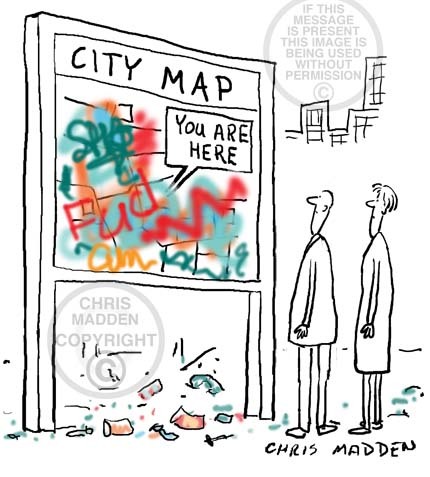 Cartoon about statistics, statistical probability, statistical bias and unreliable statistical surveys. A cartoon showing a person collecting statistics but deliberately ignoring a statistic that doesn’t fit with his preconceived bias as to what the results should be. A cartoon about unreliable statistical analysis, including such things as self-selecting groups, observer bias, prejudice. A cartoon about statistical data collection and biased analysis. An illustration showing how transport and traffic policies can sometimes take priority over social issues such as housing policy. 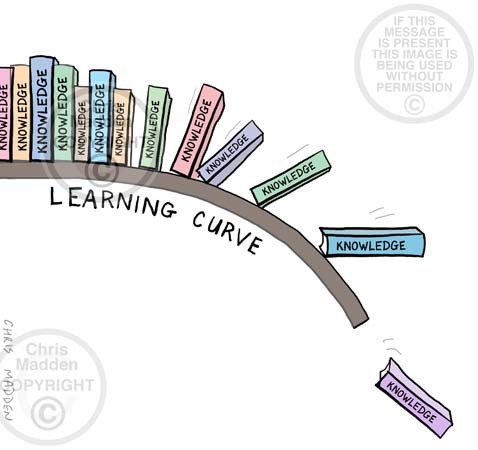 A shelf representing a learning curve. The learning curve is curving downwards due to falling educational standards. The books on the curve are falling off the end due to the downward curve. The illustration is dealing with lowering standards in schools, colleges and universities, library closures, dumbing down, knowledge acquisition.